At Rose High School, located in eastern North Carolina and populated by students on extreme ends of the socioeconomic spectrum, we have students who are passionate and active about everything from establishing a witty presence on social media to saving orphans in Darfur, but these are often extracurricular activities that don’t show up in the actual classroom. Students might spend hours posting selfies on Facebook or hours planning a benefit concert, but when they feel like they have to put on their academic persona, they tend to forget those parts of themselves. I wanted students to be able to funnel their interests into a more authentic academic experience so that they could learn about what they want to learn about and become empowered as researchers, both casually and formally. To do that, I needed to remix their idea of what research is, transform it from something boring and arbitrary into something rich and useful. When I don’t know something, I look it up. I, like most of my students, have a smartphone that puts a world of information at my fingertips, and most of the time, I remember to use it. If I see a comic on The Oatmeal about mantis shrimp, and I want to know if such a creature actually exists, I will look it up on the selfsame iPhone on which I viewed the comic. I feel empowered to research any topic I want, no matter how trivial or how important. My students typically don’t feel that sense of empowerment as researchers, as knowledge gatherers. Students at my school are typically required to write a research paper in their junior year and another one their senior year, as part of some sort of capstone project, currently Project Connect, which has them create a variety of multimodal texts and a community contribution. The possibilities are endless, but the students frequently choose research topics that they aren’t really interested in because they wait until the last second to choose a topic and end up just going with the same thing their older brother’s best friend wrote about two years ago, like the effects of overdiagnosis of ADHD in high school students. Or they just repurpose the script for the debate on gun control they did in their government class. I wanted to give them more of an opportunity to explore an area of genuine interest before they committed to a research topic for their junior paper or senior paper, so I had them become resource curators, a job that Clay Shirky reminds us is necessary with the huge amounts of information currently and freely available. Too often, students hear the word “research” and they disengage and go on autopilot, leading them to go about the rest of the research process– developing a thesis, taking notes, organizing, composing, revising– in the same arbitrary and rushed manner in which they choose topics, so I didn’t introduce this as a research project or paper. These students do, however, love to debate and argue. So I called this an “argument curation” project, and not just to sound fancy; they were actually identifying arguments and curating resources that helped inform those arguments. They had to find the resources and think carefully about what the resources were actually saying, so that their collections contained diverse opinions and ways of expressing them. Students chose general topics that genuinely piqued their interest, like social media or gay marriage, and then they identified different arguments people are currently having that are related to that subject. We spent some time in class talking about where most of their time goes and what they care about, reaching back to the This I Believe Essays they did in the beginning of the semester. Their general topic could be as broad or narrow as they wanted, just as long as there were a number of debates in the current sphere of conversation around that topic. The only requirement was that it had to be something that, for them, was high-interest. Some students chose music, and they thought of tons of arguments about music, while another student chose hip-hop, and had no trouble thinking of just as many debatable topics in this more specific category. Using their chosen topics and arguments, they created a website where they collected resources that would inform those arguments. I used Google Sites for them to create their websites, so I created my own first and saved it as a template they could use if they so chose. On their websites, they described the general topic, created page for five different arguments and gave a breakdown of why people are debating those topics. Then they had to set out to find resources, but not just any resources, resources that had different perspectives. Even those that were in contention with their own. An important conversation that we had was about where arguments are located. Where are these discussions happening? Certainly, a peer-reviewed article from a scholarly journal would be a legitimate source, but what about a Twitter hashtag conversation? Wouldn’t that show more of a real-time discussion with multiple points of view in one location? 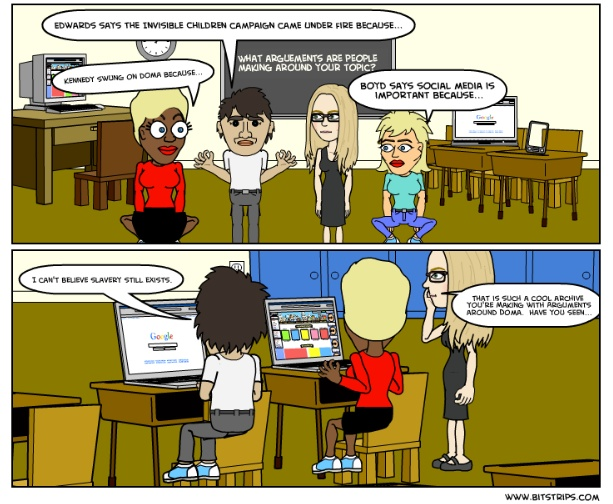 I invited Stephanie West-Puckett, teaching instructor at East Carolina University and creator of the comic you see in this article, as a guest in my classroom to discuss the difference between static, syndicated, and dynamic resources and guide the students toward using their media savvy to find resources. Based on their experience that day, students seemed to realize that they are more connected than they thought they were, both through the support of the university community and through their ability to navigate social media as a resource and not just a way to kill six hours of free time. After gathering at least three resources on five different argument topics within their area of interest, the students summarized the perspectives they saw in the diverse resources that they found. After being exposed to all of these resources and having some time to think, they themselves entered into the conversation by giving their opinion and referencing the sources that helped inform their opinion. By having a conversation with their resources, students found themselves thinking instead of repeating, synthesizing instead of summarizing. Interestingly enough, some students actually changed their original opinions and found themselves thinking in a more open-minded way after reading multiple perspectives on a topic. Some found that they were parroting their peers’ or parents’ opinions without knowing all the facts or realizing that these conversations aren’t just a two-sided coin. These conversations are much more multi-faceted than just one side or another. I had one student who was vehemently opposed to gay marriage, but after truly listening and engaging with fifteen different resources all related to gay marriage, his opinion was so altered that he ended up writing a research paper on why gay marriage should be legalized. I think this student actually began this project by doing just what I didn’t want him to do, recycling a debate topic he had already done. The difference here is that instead of looking up sources that only supported his claim, he had to listen to a variety of stances. Seeing this student bridge from regurgitating an opinion he had heard all his life to engaging in a thoughtful conversation with his resources showed me just how valuable connected learning can be. A secondary goal was to have students exposed to their peers’ interests. It’s fine for a student to be into social media, but I would like them to see why another student might be more interested in international activism. We have such a wide range of student interest at our school, and some of the students are so very globally aware, while others have only the barest awareness of a world outside the city limits.The next step was for students to branch out and respond to one another, so that even if a student’s own topic didn’t lead to any new connections, perhaps a peer’s topic would. Unfortunately, we only made it through one round of commenting on classmates’ websites, so this is one step that I will be expanding on next semester. This week, through the TRWP Connected Learning Institute and #clmooc, we have been working with the concept of hacking, and we’ve hacked everything from toys to twerking, so I’d like to hack this project in a couple of different ways in the upcoming semester to gear it more toward problem solving and making connections and contributions. Ideally, this would be a step in students deciding what their community contributions will be for Project Connect, so rather than choosing a general topic, I plan to have them work together in small or large groups and choose a problem in a community that they belong to that needs to be solved. They will gather resources on the how and and why of problem solving. I also plan to add a more interactive component, where they will have to communicate with people in their own community and in other communities. Stay tuned to find out how that works out for me.